15 spaces or less. Engraving cost will be emailed after your order has been processed. Date you need your medals? 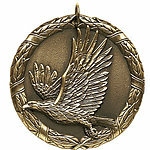 Two-inch Eagle Medals, the XR291 Medal comes with a 7/8 inch neck ribbon of your choice of color. In addition to the 7/8 x 30-inch neck ribbon we offer, a wide 1 1/2" x 32" neck ribbon. We have a wide color selection, also available is a 31" metal chain. You may select antique gold, silver, or bronze color medals. You can make all your selections as you scroll down this page. If you would like your medal printed on the back, if all medals will have the same printing it is 25 cents per medal; if each medal is different, it is 50 cents per medal. Most medals are shipped in 5 to 7 working days. We offer rush service; it is an additional 15% if we have the medals in stock. We have UPS next day, 2nd day and 3-day select shipping if needed. RUSH and Special Shipping should be confirmed by phone 1-800-787-8777. If you have any questions or would rather place your order by phone, please call 1-800-787-8777. Business hours are Monday - Friday 9:00 am to 4:00 pm central time.